Art, affectionately known as Buddy in the family, passed away peacefully at home. He was predeceased by his parents, Marjorie & Leonard Budd, his son Gerald in November 2016. Art is survived by his wife of 54 years Valeria, daughters Patricia of Calgary, Jennifer (Russ) of Carman, daughter in law Shelly of Calgary and grandchildren Robert (Mya) of Carman, Tayler of Winnipeg, Robynn (Alex), Jennifer, Tanner and Madison of Calgary, William and Bailey of Carman, his brother Douglas (Norine) nieces Christine and Angela (Jake) baby Phoenix, his cousins Vicki (Sid) of Winnipeg and Pat (Bob) of Red Deer, AB and their children. Art was born in Brandon, MB and spent his early years growing up in Churchill, MB, Ven, SK, Milden, SK and Hamiota MB where he graduated from High School and shortly after joined the Royal Bank of Canada where he worked for 18 years. During that tenure Art and Val lived in various places in Manitoba, Saskatchewan and Ontario. Art then worked at Pioneer Trust in Winnipeg and Regina where he was the Manager of Lending. He then joined Credit Union Central in Saskatchewan and in 1988 moved back to Winnipeg to work at the Guarantee Deposit Corporation then became the Manager of Lending Services of Manitoba in Winnipeg. Art and Val moved to Carman, MB in 1997 where they have resided since. Art retired in 2000 and after a time did contract work for the Guarantee Deposit Corporation and several Credit Unions until 2012 when he finally retired. Art and Val loved to travel and had many vacations around the world. He loved to go golfing. He always said his greatest achievement was his family, whom he was so proud of. Cremation has taken place and there will be no formal funeral. A private family service will be held at a later date. In lieu of flowers, donations can be made in Art’s honour to the St. Boniface Hospital Foundation, Heart & Stroke Foundation and Canadian Diabetes. Im so sorry for your loss, we are thinking of you and your family. Lots of hugs. Dear Val & family: So sorry to hear of Art's passing. Jane passed on the information for me. It has been sometime since we had our visit in Calgary. Everyone seems to get so busy with their lives. We are fine. I'm sure the family will provide lots of support. Take care. 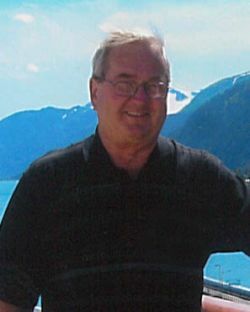 I have had the pleasure of Art's company on many occasions throughout my career at Swan Valley Credit Union (Swan River) and within the Manitoba Credit Union System. He made many contributions to our credit union and the CU system as a true professional and a friend. Sandy and I were saddened to hear of Art's passing last week. I recall so many times from our loan inspection days when we worked so hard by day and enjoyed meals and a sharing of our personal lives in the evenings. He was a terrific guy and will be missed. Our thoughts are with the family. We are so saddened to hear the news of Art's passing. Many wonderful memories of special times we spent together. Art always had a joke or two with his dry sense of humour followed by his special giggle. Art was a kind man and a true friend. He will be missed by all who knew him. Will miss Art at our coffee sessions at the Carmangolfandcu rlingclub. Always enjoyed Art's friendly nature!